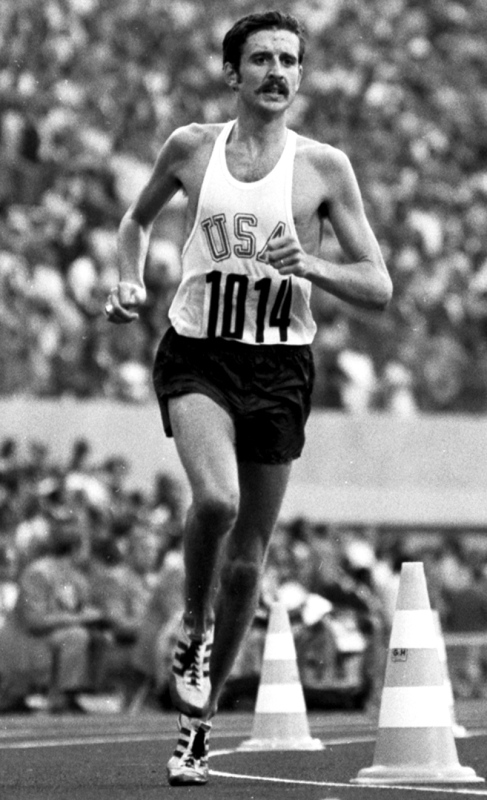 The American Frank Shorter was the dominating marathon runner of the 1970s. In 1972 he won the marathon at the Olympics in Munich. And he did in a very impressive way: Already in the first half of the competition, he broke away from the rest of the field. He finished more than two minutes before everyone else. Four years later, at the Olympics in Montréal, he won the silver medal. Between 1971 and 1974 Shorter also managed to win the prestigious Fukuoka Marathon in Japan four (!) times in a row. Shorter’s Olympic victory did not only represent his most important sporting victory. His success also raised awareness of running among the American population (the Olympic marathon was broadcasted live on US television) and this is how he played a central role in making running attractive for the broad masses. His achievements, especially the victory at the Olympics in Munich, thus significantly contributed to the running boom to emerge in the USA. Shorter’s career was remarkable for various reasons. Frank Shorter shortly before his greatest achievement: winning the olympic marathon 1972 in Munich. First: It was utterly successful. He won ten out of the fifteen marathons he took part in. His worst result, along with an abandonment, was a fourth place. Shorter achieved all of those victories between 1971 and 1975. This shows that he performed at the absolute top of marathon for six years. How could he succeed for such a long period of time? Most probably, as a result of his belief in the importance of peaking his shape before major competitions. He finds it almost impossible to be in the best shape possible two times in one season, he says. As a consequence, he only participated in a few important competitions a year and he tried to always be in his absolute top shape only for the Fukuoka marathon and the Olympics (thus, to “peak” his shape). Second: Shorter was no top athlete in his school years. It was only at the end of his academic career that he started to train seriously ant to achieve good results. Third: Shorter initially trained on track. He was very competitive in 5000m (PB 13’26’’) and 10’000m (PB 27’45’’) as well. This is something he has in common with runners like Paavo Nurmi, Emil Zatopek or Derek Clayton. Those three points can be a lesson to learn from for every amateur runner. Firstly, it is worth focusing on a few important competitions a year. This especially applies for longer distances. Training or preparatory competitions are always possible, of course. Secondly, it is not necessary to be at the top at a young age. For longer distances, structured training can lead to great results even at a later stage. Thirdly: Fast legs on shorter distances lead to better performances on longer distances. This explains the importance of speed work and interval training. There is no rest day indicated in Shorter’s weekly program above. I raced against Shorter and Rodgers, including in the marathon with a best of second to Rodgers in 1977. Rodgers advised me to follow the regimen that worked for him: 120 – 140 miles per week, which means 20 miles per day for 6 or 7 days per week, two workouts a day except for one 20 mile run day. That worked for me for the first two years. After that injuries grew more frequent and severe. When restarting training after an injury layoff, I found that it took three weeks of increasing fatigue until I reached stasis. I.e., that my body suffered from a severe stress just doing 20 miles every day. That was not relieved until my two week taper prior to a marathon. The “lift” and the body’s impatience to feel that fast stress again for race day after that taper was incredible. The biggest lift was one week out when the taper dropped to one workout a day from two. Later Shorter told me that he did only 100-110 miles per week. He included more quality/speed work and less quantity/mileage. He said he couldn’t handle the higher mileage that Rodgers did. Rodgers told me that he just didn’t have the same track speed as Shorter and got better results with more miles. Shorter gave me a favorite speed workout of his – 20 x 400m at a fast (mile pace) with quick run recovery of between 60 seconds on down to 100m at 6:00 pace when nearing his peak. A progression of these 1x per week or two with the brief recovery time between repeats declining helped my times a lot. Rodgers said his marathon success was built on a lot of fast 10Ks (usually races, because he got paid) plus 5-6 x mile repeats at 4:30 – 4:40 pace. Better suited to his strengths. I found the miles intervals harder, physically and especially mentally, compared to the 20 quarters workout. But both were important to fast marathons in my experience. Max three hard workouts per week. Could be 1x track speed, 1x medium long tempo or farther, 1x long run. All done at a businesslike brisk pace. Minimum one “easy” day in between. Better to take one day off a week, for body and mind to recuperate enough to not burn out of get injured. Yes, the importance of a training program with phases leading up to a peak at race day is what worked for Shorter, Rodgers and me as well. I saw that the medals went to the athletes that timed their peak the best for race day, other factors aside. Both Shorter and Rodgers told me that at the top races and the Olympics, correctly timing your peak was the biggest difference in performance among elite marathoners. And avoiding injury or illness.